As persimmon purée is very sweet, I put a little less sugar in the persimmon muffins; and the chocolate chips there were rather pointless (but don’t tell him that!). 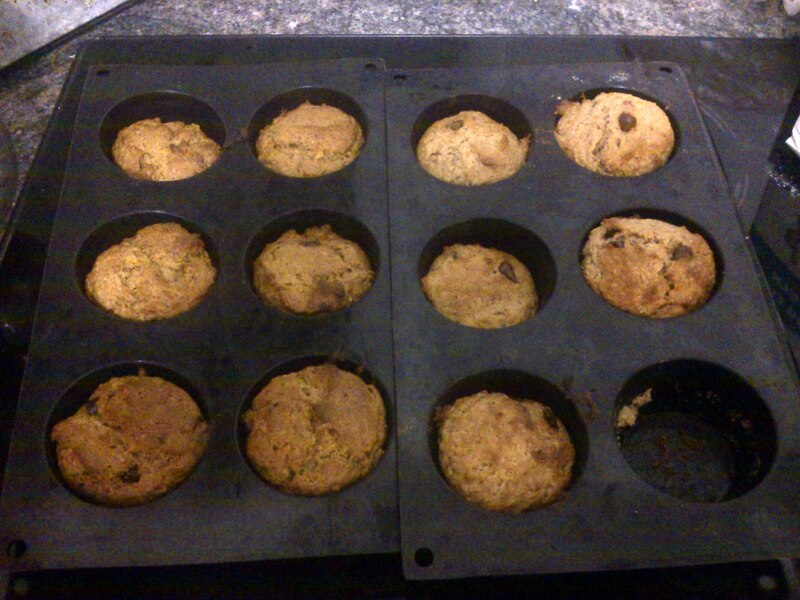 The yoghurt muffins were also excellent and there the chocolate chips really hit the spot. In both cases, mix wet ingredients together, then mix dry ingredients in a separate bowl, then mix both until just combined. Spoon into muffin pan until 2/3 height. Bake in a preheated oven at 180°C for 15-20 minutes or until toothpick comes out clean. 2. 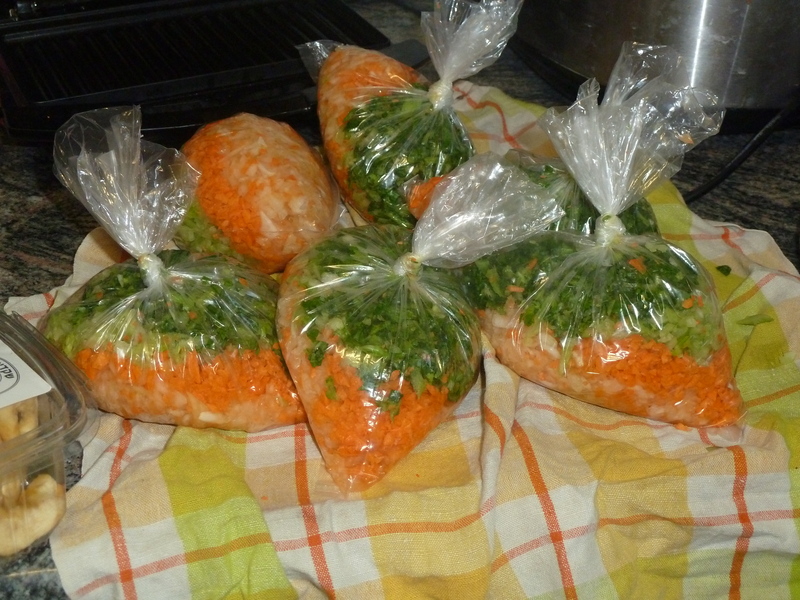 6 bags of carrot + celery + onion mix for my freezer. 3. 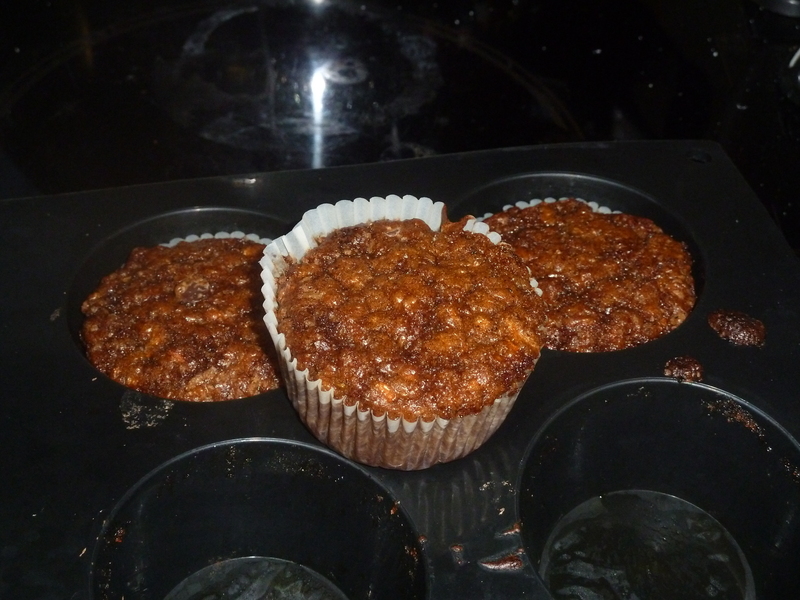 Carrot muffins as a hostess gift (we were invited to dinner). 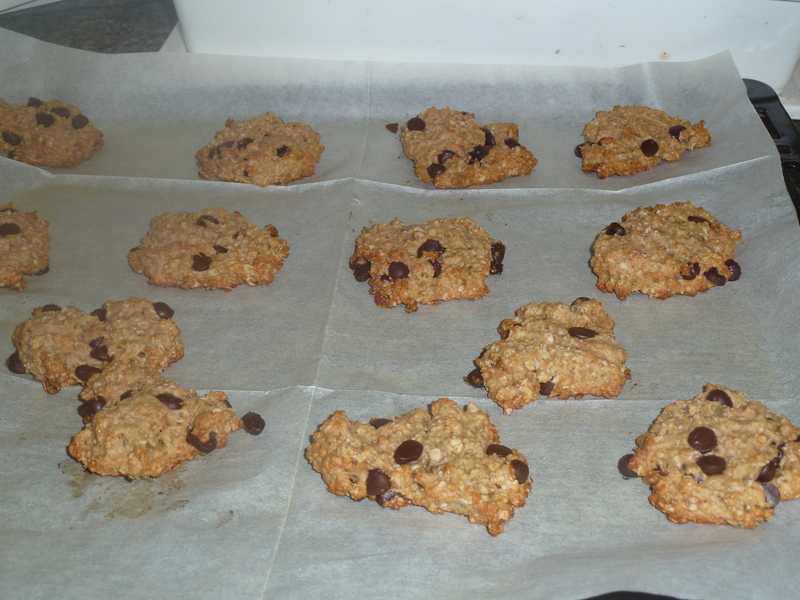 As our friends don’t eat refined sugar or white flour, I substituted the 3/4 cup sugar by 1/2 cup of honey, omitted the chocolate chips, and baked for 25 minutes at 10 degrees less (170 degrees). 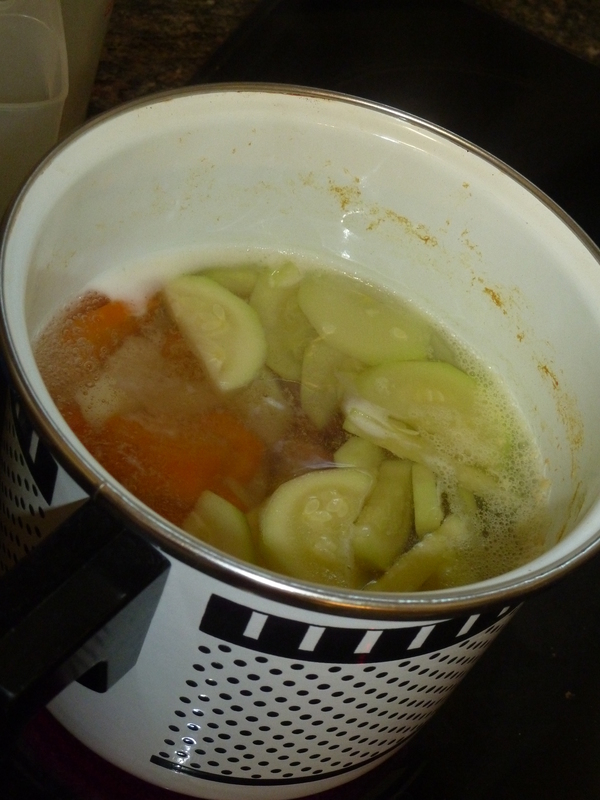 Notes for next time substitutions: less honey and more cooking time. It was just a little too sweet and just cooked. But it tasted awesome! Obviously, if I’m reading Nora Roberts books at the rate of one a day, and taking care of all my kids in the summer vacation (G-d bless my husband, who takes part or all of them and arranges all kinds of projects. Otherwise I would already be nuts by now), I don’t have much time for cooking. But before all the kids were here, I had a hankering to do something special with leftover chicken. I wanted something with dough, as well. So I chose chicken pockets. 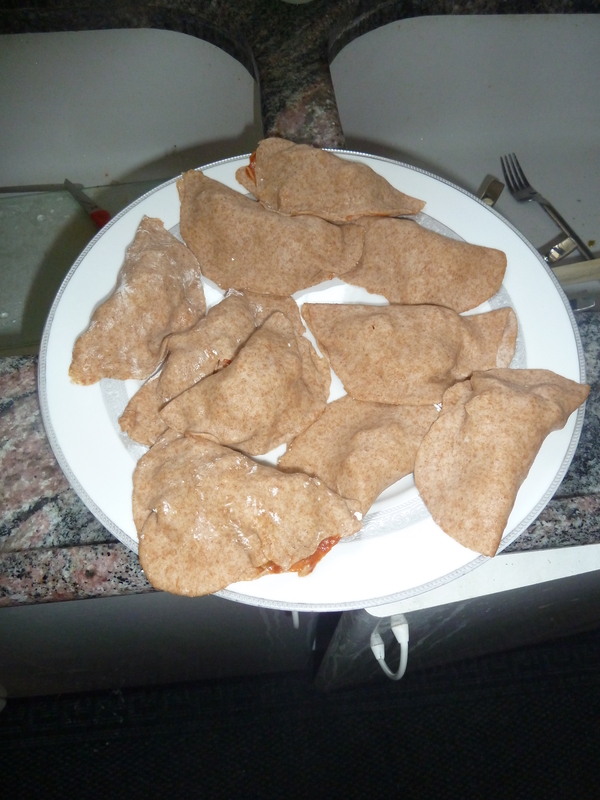 I based on this recipe (Hebrew). The dough turned out delectable, and so easy to make. I completely changed the filling to fit my leftover chicken, and did the simplest filling I could think of to save time and effort. Also, I made only half the amount. Sift the flour into the bowl of a food processor fitted with bread hooks, add the boiling water and mix on low. Add the oil and mix again. Add the cornflour and knead for 5 minutes. (See? Easy!) 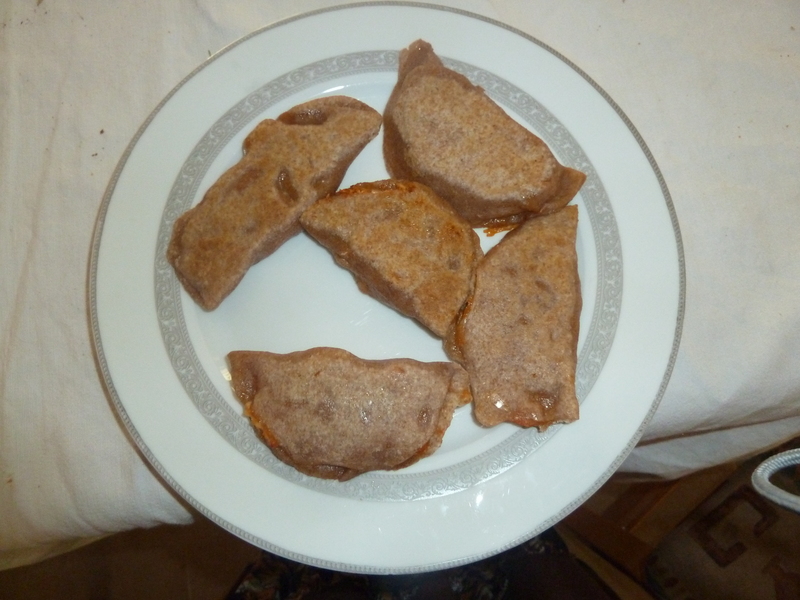 Put more cornflour on your workspace and make a fat sausage from the dough. Cut dough into 10 equal parts. Roll each part into a circle. Put one tbsp of filling in the center of each circle. With an egg brush, put water on the edge of half a circle. Fold the circle in half, using the water as “glue”. Fry each pocket for ~5 minutes on both sides or until brown. It is also possible to steam them for 7-8 minutes instead. Eat with dipping sauce of your choice (I ate without, it was good!). Unfortunately, if he tries to play with it too much he ends up shutting down the computer by mistake. And then we don’t turn it on until he’s asleep or even the next day, so he’ll learn. 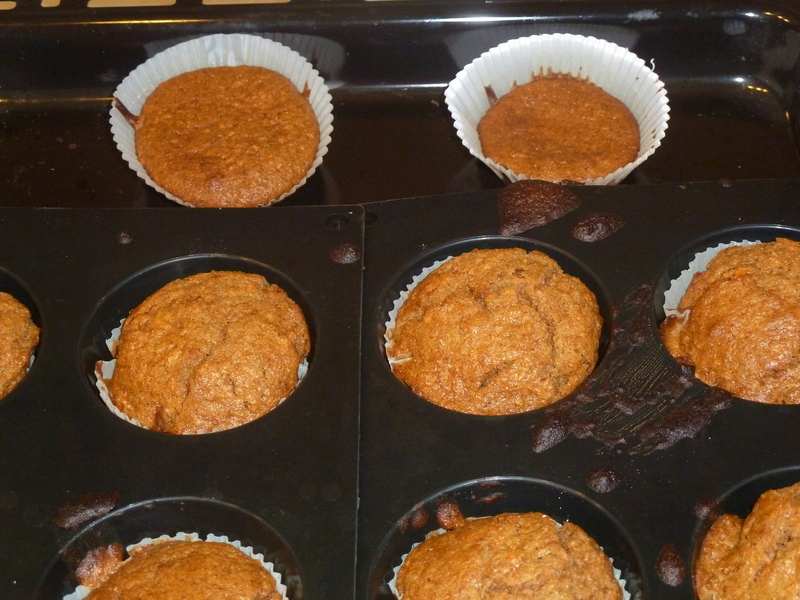 And that presented me with a problem: I wanted to make muffins. The computer was closed. My laptop was at work. My husband (who also has a laptop) wasn’t home. How do I get a muffin recipe? And then I remembered my large collection of cookbooks. Since I discovered the joy of recipes via the internet, with reviews and stars and all, I don’t use my collection much. But surely I have there somewhere a recipe for muffins? Preheat oven to 180°C. The original recipe begins by specifying “beat the eggs and oil until pale yellow and frothy…” but I basically ignored that and used the basic muffin method: mix all wet ingredients together; mix the dry ones in a separate bowl; mix the two bowls until just combined. If too dry than add some water. Spoon into muffin tins or cupcakes. Bake for 20 minutes or until a toothpick in the center comes out clean. Bon Apetit! Carrot Muffins. There were 14 here a minute ago...? My little one (3 years old) visited a friend and ate there some chocolate chip cookies. He said “I want to make with you chocolate chip cookies just like at my friend’s!”. “I said, “Sure”, but thought – no way. I don’t make just chocolate chip cookies. Let’s try and put some oatmeal in them! (Yep, that’s how I think all the time. My husband is slowly wearing down under the pressure 🙂 I actually got him to eat a few).